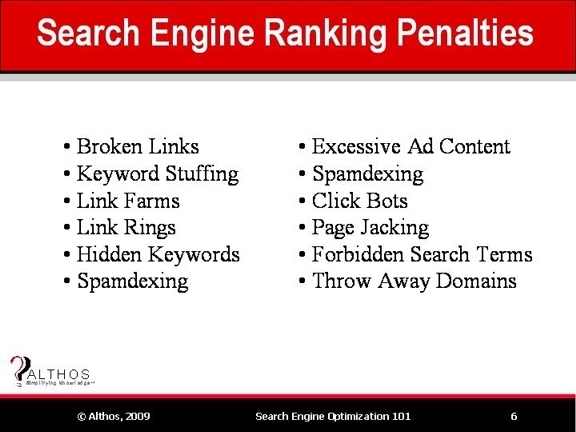 Search engine ranking penalties are values that are subtracted from search ranking levels as a result of negative attributes. Search Engine Sandbox - A search engine sandbox is a restricted access area (possibly when a domain name is initially activated) to allow verification of the validity of the web site. Broken Links - A broken link is a hyperlink that has a path that can no longer connect to a file or other resource. Keyword Stuffing - Keyword stuffing is the adding of keywords into the content of web pages. Link Farms - A link farm is a group of web sites that are setup to provide links to other web sites. Link farms often lack any relevant content and contain links to various web pages because their key purpose of the links is to increase the ranking of search engines for the linked web pages. Link Rings - A link ring is a set of web pages that are linked to each other to form a continuous link path that allows navigation from one of the web sites through the other web pages that eventually lead back to the originating point. Hidden Keywords - Hidden keywords are text that is contained within a web site that cannot be seen by the viewer. Hidden keywords may be text that is set to the same color as the background, text that uses a very small font, or text that is positioned below or at locations that are not seen by the viewer. Spamdexing - Spamdexing is the use or inclusion of media (such as multiple keywords) in a web page that are not necessary for the visitor but are intended to influence the ranking of search listings. Excessive Ad Content - Ad content is a measure of the number of ads or amount of ad content as compared to the total content of a web page. Excessive ad content (such as 90% ad content) can reduce the value of web pages to search engines. Click Bots - A click bot is a software program or service that can automatically select links or objects on web sites. People or companies may use click bots to artificially inflate the number of web page requests to increase web site popularity. Page Jacking - Page jacking is a process of using or copying content from another web site that may be used to trick visitors into thinking they are visiting a different site. Forbidden Search Terms - Forbidden search terms are words, phrases or character sequences that a person or system submits to a search engine which are refused for processing by the search engine. Forbidden search terms may include hate messages, military secrets, or unlawful content. Throw Away Domains - Throw away domains are web addresses (URLs) that are setup for search engine optimization using tactics or options that may get them delisted if they are discovered by the search engines.